Introducing the Tennis Psych: One-Day Seminar. Sports Psychologist and ranked tennis player Mike Abrams designed this successful seminar. The next Tennis-Psych Seminar will be on March 3rd at New York Sports Club in East Brunswick. It will be from 3pm to 9:30pm. I will be working with Mike at the upcoming seminar. New York Sports Club members will get a 10% discount. For more information go to http://www.tennispsych.net . If you sign up, tell Mike that Roger sent you. To play your best tennis you should be thinking in pictures not words. Psychological studies of top athletes brain waves during competition have provided some very interesting information. First of all they found interesting readouts in the two hemispheres of the brain. The left brain or the logical, analytical and language processing part of the brain was very calm and in an alpha or meditative brainwave state. The right brain or the creative and more visual part of the brain was found to be extremely active. The conclusion that Mike drew from this is that to play your best tennis you should use visualization instead of thinking with words and language (a left brain function). Instead of giving yourself mental commands, you should picture yourself having successfully made the shot. Don’t break the shot down into parts, instead think of the whole shot. That is how to program your subconscious mind to do what you want it to do. Try this experiment the next time you go out to play. First try giving yourself verbal commands before you hit your shot. Say for instance that your working on your backhand. Tell yourself to bend and swing low to high. And do it just before you hit the ball. 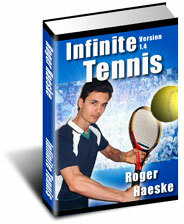 What you may find is that it is next to impossible to think about mechanics and successfully hit a tennis ball. There are literally millions of computations that your subconscious is making in order to hit a tennis ball. By giving yourself verbal instructions you are trying to hit a tennis ball with your conscious mind, which is something the conscious mind is not very good at. Next time try picturing the end result. Picture having hit a successful shot with lots of topspin, power and great placement. Imagine that you were able to hit it easily and you were in balance. Feel the joy of a great shot and the confidence of a champion tennis player. Put it all into one image and feeling. Then trust your subconscious to send you the FEELING necessary to produce your visualized results. I’ve found my game really improves by picturing the end result as opposed to trying to instruct myself with step-by-step mechanics. It really almost seems illogical and you have to trust in a power that is more intelligent than your conscious mind. In fact it almost feels like your not really doing it. Like someone else is hitting the shot for you. For more info on this topic, I recommend you read the classic book, “The Inner Game of Tennis,” by Timothy Gallwey.